anxiety: A sense of apprehension, uneasiness, or fear often over an impending or anticipated ill — from Latin anxius “troubled, uneasy”. 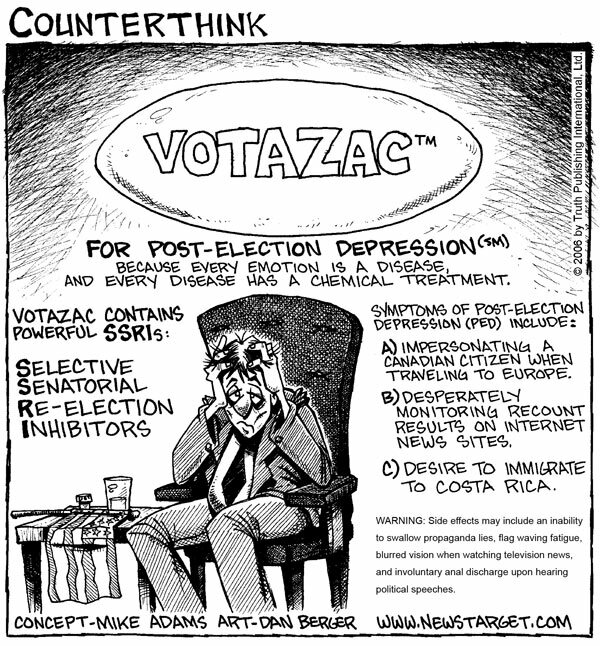 The mental health (aka psychiatric) community is all over this, warning Americans about election stress deteriorating into depression and salivating over the number of anti-depressant prescriptions they can write. Many people are not only convinced that the environment is dangerous, but that it is steadily growing more so. For many, it’s more of a challenge than they feel up to. An “environmental challenge” exists in an area filled with irrationality. While we thrive on a challenge, we can also be overwhelmed by a challenge to which we cannot respond. A wide variety of environmental stresses can contribute to the onset of anxiety. Find something in your environment that isn’t being a threat. It will calm you down. The answer to this anxiety and stress is, of course, direct action. Take some positive action over which you have some small measure of control — write a letter to the editor; write a letter to your local, state and federal representatives; contribute time or money to a worthwhile cause; take some self-improvement course. The Diagnostic and Statistical Manual of Mental Disorders (DSM), the billing bible of the mental health care industry, names stress explicitly as a billable diagnosis: Trauma- and Stressor-Related Disorders (an entire chapter in DSM-5); including various manifestations of PTSD, acute stress disorder, adjustment disorders, and reactive attachment disorder. Their answer, however, is not action — it is drugs. They even have a class of drugs specifically marketed for this, called anti-anxiety drugs. These drugs come with side effect; one of the side effects is more anxiety. Other side effects can be hallucinations, delusions, confusion, aggression, violence, hostility, agitation, irritability, depression, and suicidal thinking. These are also some of the most difficult drugs to withdraw from. We would like to make it very clear that ANXIETY and STRESS ARE NOT A MENTAL ILLNESS! They are the reaction to a stressor, something over which you have no control. The answer is to find something over which you do have some measure of control, and take action on it. One of the more common American causes of anxiety is hypoglycemia. Yes, mental anxiety is one of the symptoms of low blood sugar, which is usually caused by consuming too much sugar. So, if you are feeling down about the election, forego that self-indulgent donut and write your congressman instead!